CrochetSal's: So I have a slightly twisted sense of humour. So I have a slightly twisted sense of humour. Just slightly, mind you! 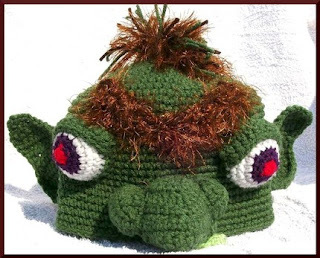 When Etsyhookers Team on Etsy started a challenge for strange hats, I discussed this with my 10yo while waiting (for 45 minutes AFTER our appointment time) at the hair dresser's. I told her 'no holds barred! ', and she came up with a runny nose idea. Imagine, talking snot while people are trying to improve their appearance! Anyway, from the runny nose came the Snot-Nosed Goblin. I must admit, Allie's disappointed, it doesn't look like the picture she had in her head. It was kinda hard for me to see that...so I had to go with the one in my head. Fortunately, the finished item looks a lot like the one in my head! The hat is now for sale in one Etsy shop...the pattern in the other. The hats submitted for the challenge are all in, and voting is now taking place. If you'd like to see all the hats created for this, and vote, you can pop in here: Etsyhookers Blog. And that little bit of light green....that's the snot drip! !